CHICAGO, IL, UNITED STATES, August 8, 2018 /EINPresswire.com/ — After the successful publication of the action-adventure series, The Girl With the Lightning Brain, the book continues to gain positive feedback from the readers from all over the world. It is undeniable that this groundbreaking series written by the one and only, Clifford Ratza, satisfies the minds of those who find joy in reading action-packed sources. While other adventure books offer a voice that focuses only on the character’s adventures, Ratza’s book challenges every reader to travel to the depth of their thoughts. As the extrapolation of the latest science commences, the unearthing of details from political intrigue, the rising of contemporary lifestyle – factors that give the twists in the life of Electra “Kit” Kitter. As the book reaches to a wider audience, great reviews continue to dominate. One of them states: “An outstanding page-turner! Totally engaging plot and characters. Provides multiple layers of reader enjoyment. I look forward to its sequel.” – Voracious Reader. Ratza invites those who have not read the book to get a copy today and witness how a girl’s brain and strength become her weapon against the harsh reality in the world she lives in. Author Cliff Ratza characterizes himself a "simple scholar," having parlayed multiple degrees (math and physics, business and computer science) into a business career spanning numerous jobs, companies, and industries. He grew up in Chicago, graduating from top Illinois universities, then launched his business career. He returned to Chicago, where he teaches at several universities while continuing to work for corporations. He subsequently started a sales and marketing consulting business, and most recently added a writing career to his resume. Cliff has written extensively throughout his career. He has published articles in four professional journals, writes copy for client Websites, and develops press releases or newsletters. He has already written three novels in his ground-breaking "Lightning Brain Series." 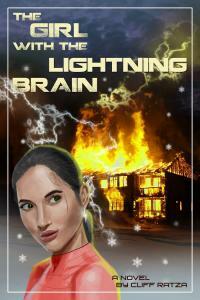 The first, "The Girl with the Lightning Brain," is now available in print or e-book format at bookstores or online. Please visit www.authorcentrix.com or call 8885040951 for more details when you are ready to buy. Cliff dedicates the series to readers everywhere and invites them to visit the "Lightning Brain" Website, www.lightningbrainseries.com, to learn more about the books or enter reader contests.